Bright 3-element LEDs in a variety of colors. #44/#47 style with metal bayonet (twist-in) base. 6-volt AC or DC. 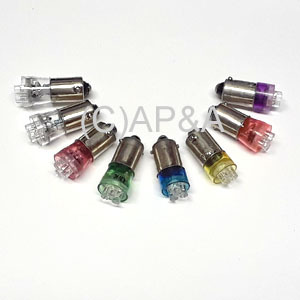 Best for playfield lamp inserts and bright, focused lighting.Bright 3-element LEDs in a variety of colors. #44/#47 style with metal bayonet (twist-in) base. 6-volt AC or DC. Best for playfield lamp inserts and bright, focused lighting. Need brighter, or non-ghosting LEDs? Try our 4-Element LEDs.